The importance of being earnest soil. It may sound hokey and if you’re an experienced gardener this will be preaching to the choir, but gardening really does start from the ground up. Plants really do perform better in soil (or other growing media) that suits their preferences, as we all do. Adding fertiliser will only get you so far. Every year I grow garlic. Nothing fancy, just the stuff from the supermarket that sometimes starts to sprout, often as soon as you get it home (you never know how long they’ve had it in storage). I know I shouldn’t do it, and neither should you. Anyway…do as I say, not as I do. Last year, however, I also planted a horticultural variety called ‘Music’. I harvested it all today and the day before yesterday. The two groups at the top were planted in compost. I dug a trench, filled the bottom with compost, planted the garlic cloves in it and filled it back in with the dirt I dug out. The upper left is the ‘Music’ garlic and the upper right is the supermarket stuff. The group at the bottom is supermarket garlic that was simply planted in the regular garden soil, which in my case is mostly clay. I didn’t include a size indicator, but the supermarket stuff at upper right is comparable in size to, well, the garlic from the supermarket. They all got the same amount of water (rain), sun, fertiliser (comfrey liquid), etc. The compost-grown groups were planted next to the roses and the other group was planted in a fallow bed in which I’d previously grown strawberries. 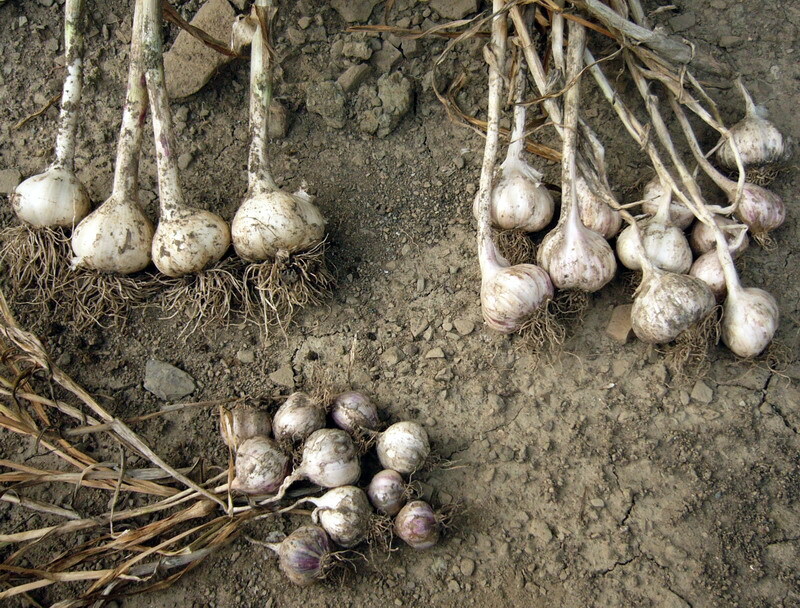 They were all planted in October: garlic always does better when planted in autumn. Spacing varied, but the compost-grown supermarket type was by far the most crowded. See the difference? Most plants will grow in soil that is less than optimal for their likes – after all, being non-mobile they need to make the best of what they get. For plants that like soil that’s fertile and friable, compost really is worth its weight in gold. When I dug the garlic up, there was barely a trace of all the compost I worked in.